Having grown up in a sporting household I was exposed to cricket from an early age. My earliest memories involve going to Tonbridge Sports Ground with my mum & brother, laden with food, picnic rugs & liquid refreshment to last us all afternoon while watching my dad & his team play. I didn’t grasp the rules until I was a little older & if I’m honest my brother & I found riding our bikes around the sports ground & foraging in the woods far more entertaining! However, once I took time to listen to my dad explain the rules & came to understand cricket a bit better the game really grabbed me, & while my friends found the idea of watching 5 days of cricket a bore I was glued. These days I do not watch as much as I would like as I do not have the luxury of Sky Sports but I follow England when & how I can. My favourite memories in the last few years have been following the Ashes on the radio while on camping holidays. Huddling around the radio that is inevitably resting on my dad’s camping chair. To all English (& Australian) cricket fans the Ashes is a BIG deal. It’s not just another Test Series. In 1882 the Sporting Times newspaper printed a mock obituary following England’s first defeat in a home Test against Australia. Inspired by this message a group of Australian women presented Ivo Bligh (the England Tour Captain) with an urn containing ashes (of possibly a ball, bail or veil no one is quite sure). Since that 1882-83 tour all Tests between England & Australia have been regarded as the Ashes series (except for a couple in the 70’s I’m reliably informed). 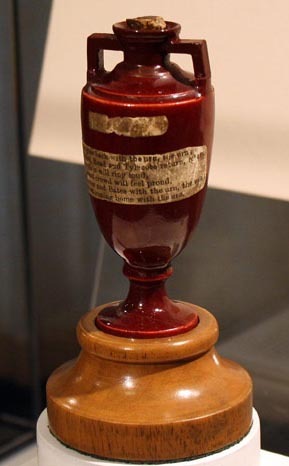 “Ownership” of the Ashes is given to whichever team achieves an outright victory, with a replica of the urn being presented to the captain. The original urn was given to the MCC by Ivo Bligh’s widow after his death in 1927. My main memories of English cricket relate to the 1990’s/early 2000’s slump when Australia won seven successive series. I should think my hopes weren’t the only ones dwindling. England’s win in 2005 was therefore a huge deal for the team & the country. Hope was reignited & quickly quashed as Australia throughly trashed England in the following series. However, since 2007 we have won the Ashes twice & all eyes are on who will be chosen to defend our title this year. To all intense & purposes we are not just playing cricket when we play Australia in the Ashes. We are fighting for our honour, defending cricket & our right to play it. We do not want another humiliating obituary. So good luck to the boys & long live English cricket!! This entry was posted in Extracurricular Sport and tagged Ashes, Australia, Downing Street, England, Marylebone Cricket Club, Sky Sports, Sporting Times.